The Brandisia hancei Hook. f. ( Scrophulariaceae ), a traditional medicine plant in China, three phenylpropanoid glycosides were isolated, which structures were identified as 2/-acetylacteoside, acteoside and poliumoside together with mannitol and dolcitol. From the acetone extractive of lichen Lobaria isidiophora Yoshim. a new depsidone isidiophorin ( 1) together with 8 known compounds are isolated. Stictic acid, norstictic acid, cryptostictic acid, lecanoric acid, retigeric acid A, B, and methyl, ethyl orsellinates were identified. The structure of isidiophorin was elucidated on the basis of spectra and chemical methods. From the dried roots of the Chinese drug " Zhong-dian Qian-hu" (Peuce-danum sp., Umbelliferae) , a new coumarin d-laserpitin (1), together with four known coumarins silinidin (2), pteryxin (3), bergapten (4), ammijin (5), as well as (3-sitosterol have been isolated. On the basis of spectroscopic data, the structure of the new coumarin d-laserpitin (1) has been elucidated as 3'(S)-hydroxy -4' (S) -angeloyoxy-dihydroseseHn. A radioimmunoassay ( RIA ) that can be used for the quantification of formononetin is described. The assay utilizes antisera raised against a formononetin -7-0- (carboxymethyl) ether hapten. The tracer used was a (H3)-derivative of formononetin that was stable at least for 2 months at 4 1C . Gastrodia elaia is a plant parasitic on fungi Armillariella mellea The mycelia infect the primary corm of the plant, and are arrested and digested by the corm at its cortex layer; the released nutrients are mainly transported to the secondary corm which can prevent the infection of the fungus. In Parashorea chinensis population there is a great breeding period at intervals of each 3-4 years. During this period the Parashorea can produce about 2000-6000 seeds per tree which is about 30-40 cm in bdh and about 60-80 years old. The seed dispersal range is very limited in a circle of 15-30 meters far from the mother tree. The germination capacity is 68.90 and seedling survival rate 22.35. There are about 0.72 of seedlings growing up, but less than 0.023 of seedlings entering the highest storey in population's vertical strata of the Parashorea. It means that 20 000 seeds are needed for one tree developing into the highest storey. The population of the Parashorea is very difficult to spread because of the seeds concen-trated on a limited range in high density and the high mortality existed in every developing stage of the age clases. Pollen grains of the family Elaeocarpaceae in China have. been examined under LM and SEM. The results show that the different sizes of the pollen grains of the family range from 9 urn to 15am, 3 -colporate, os lalongate, under LM exine psilate and the stratification of exine is faint. The pollen morphologic characteris-tics of the family are so similar that the genera Elaeocarpus, Sloanea and Muntingia cannot be distinguished under LM. Under SEM, the genus Elaeocarpus is of three types of exine ornamentation and that of Sloanea is nearly the same as one type of Elaeocarpus, therefore the two genera cannot be distinguished even under SEM. Muntingia can be telled from the other two genera by its exine ornamentation but the difference among Muntingia and other two genera is not strong. The results above suggest that the members in the family be a rather natural group and should be treated as a distinct family rather than parts of the family Tiliaceae. The size and the exine ornamentation of the family are much different from those of other families in the order Malvales. 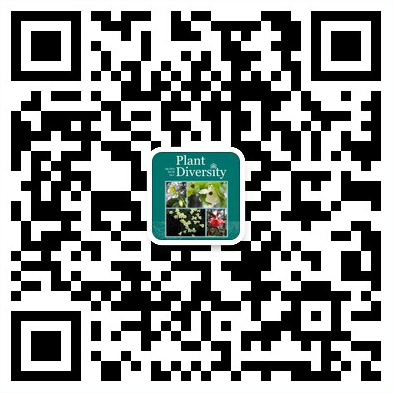 The use of the difference of space distribution stand for the progress of time set up the static life-tablp of Parashorea chinensis population, which is a main dominant and rare species of tropical seasonal rain forest, in Bubeng region situated in the south of Yunnan Province (21'25/-21'8/N, 101'4/-101'2/E). Sporophorum annuum,sessiles, suberoso-lignosum. Pileus dimidiatus，3－5x3-4cm diam.2一2.5 cm crassus. Superificie brunneus,nigro-brunneus，concentricis cristis et ca 0.5 cm altis et0.7-1cm latis, tuberculatus，longitu-dinaliter rugosus indistinete，aequalis，laccatus，margine plano, obtuso, brunneo-rubro vel purpureo－rubro．Contextus bistratosus，superior lignoso-coloratus，inferioreburneus，1-1.5 cm crassus．Tubuli0.3-0.5(0.9)cm longi. Pagina pororum. Planta mediocris. Rhizomata erecto vel ascendenti. Frondibus fasciculatis. Stipite paleis aureis lanceolatis obtecto. Lamina pinnata vel bipinnata. Indusiis grandibus conchiformibus coriaceis tatum sorum arcte tegentibus. Affine A．styloso Stapf,sed racemis et floribus et pedicellis glabris differt．Tubera obconica,circ. 5 cm longa，1.2 cm crassa．Caulis circ．60 cm altus，simplcx, laxius retrorso－puberulus，aequaliter foliatus．Folia caulina inferiora subanthesi emarcida, media longe petiolata,petiolis 3-5.5cm longis gabris;lamina supra parce puberula, ambitu pentagona, circ.5.5-6.5 cm longa, 5-8 cm lata，basi cordata，ad 5-10 mm supra basin tripartita，partitione media ambiturhomboidea acuminata subpinnatim inciso-lobata，lobis oblique triangularibus pauce lobulatis vel grosse dendatis,partitionibus lateralibus ambitu flabellatis inaequaliterbifidis. Proxima D．martabanicae Clarke,sed flore singulari，corolla breviore, staminibus 8,endospermio laevigato differt;a D．pilosula(A．DC．)Hiern foliis subtus persaepe dense pubescentibus, nervis lateralibus utrinsecus10-15,ter-tiariis utrinque conspicuis, flore 5- mero, flore singulari,antheris attcnuato-ovatis apice acutis differt. Subsection Fortunea is one of the original Subsection in Rhododendron Subgenus Hymenanthes, it containing 26 species and 7 subspecies and 12 varieties. 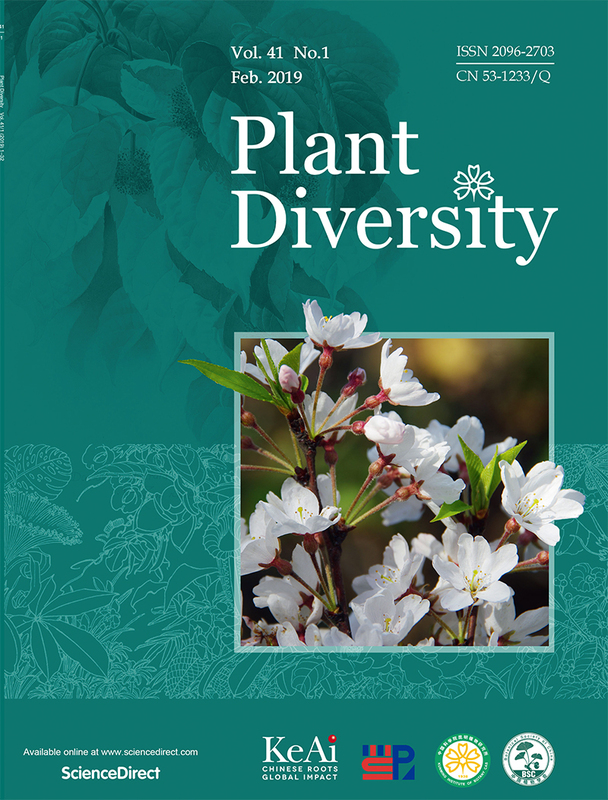 All of the species divided into seven plant-groups according to the morphological characters and geographical distribution and the relationships of all the plant-groups are discussed. There are two figures shows the distribution of six plant-groups in Sichuan and the other one shows the relationships of their evolution of some plant-groups from A to E and shows F and G to be isolated. Subsection Fortunea has a recent center in western region of Sichuan. In order to study the phylogeny and evolution of genus Rhododendron, we detail six problems as follows; 1. The problems of classification and system of Rhododendron are discussed and the recent articles by H. F. Copeland (1943) , H. A. Seithe (1960, 1980) , M. N. Philipson and W. R. Philipson (1986) are also reviewed. We believe that the system proposed by H. Sleumer (1949) is a natural system. 2. The systematic position of Rhododendron is recognized as a representative original genus in phylogenetic process of the family Ericaceae.